Julie Cunningham’s program, To Be Me, presented at Laban Theatre, follows less than a month after her performance of m/y that was part of Reckonings at Sadler’s Wells. 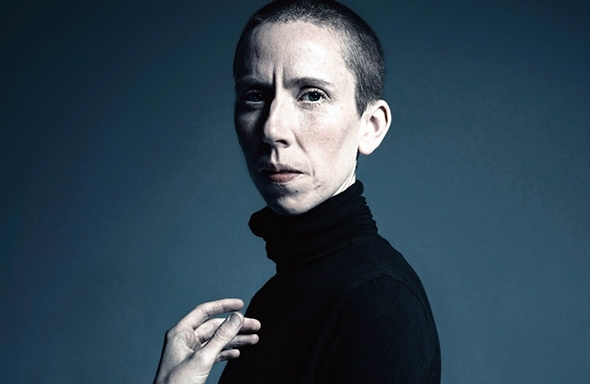 Both performances are a celebration of self, in part inspired by Monique Wittig’s 1973 novel, The Lesbian Body, in which the author articulates ‘feminine desire’ through her experimental use of language. In the 1990s Judith Butler questioned the idea that gender is biologically innate suggesting that it complies instead with the individual’s adherence to social norms, that it is in other words performative. Whilst we all to various degrees articulate our own identities around existing cultural narratives, Butler argues for the freedom to express one’s own gendered life. This is the choreographic challenge Cunningham takes up in the first half of the program: a solo created on herself, m/e, that borrows from Wittig’s experimentation in language and Butler’s intellectual argument to confer on her dancing body a confidence and freedom that surpass the physical. Wittig’s novel seems to have set Cunningham free to unravel the multifaceted performative possibilities of her body as if she has emptied herself of the outward trappings of any previous dance form she has known — Merce Cunningham and Michael Clark are strong influences — and kept only what is necessary for her own ‘writing’. m/e opens with Cunningham facing back; dressed casually in a t-shirt, track suit top and pants, she tries out steps to the nimble rhythms of Fever Ray’s To the moon and back, demonstrating the fluid possibilities of free choice through her ability to move in whatever direction at whatever moment and speed. Her style is sparse but with an understated eloquence that derives from her singular choreographic instrument: not only a body that is articulate and beautifully extended but a gaze that remains within the confines of the stage rather than projecting itself beyond it; when she looks in our direction it is as if she is in a studio and we are behind the mirror. It is this duality of extension and containment, of exterior and interior, that makes the section she dances to the Andante of Shostakovich’s piano concerto No. 2 such a revelation. She does not allow the emotion of the music to move her but imposes her own quiet will on it; it is her spatial relation to the musical phrasing that attunes her sense of identity. After this meditative interlude Cunningham interrogates the first of two pieces, Triangles, by composer Nell Catchpole in which she experiments with vocabulary as Wittig may have experimented with language; she plays a conceptual game with a blue ball that makes a re-appearance from m/y before returning to her upbeat exploration of space to Catchpole’s second piece, Skipping, where you can almost sense her changing her mind, dodging and darting like a sprite with dizzying self-confidence. Having exhausted her experimentation she walks forward as if to say, ‘I still haven’t really showed you who I am’ and walks calmly into the wings. True to the spirit of containment, she does not return for a bow. To Be Me is also the title of the second work, set to Kate Tempest’s spoken word, in which Cunningham is joined by Hannah Burfield, Eleanor Perry and Seira Winning. They are all costumed (by Stevie Stewart and Cunningham with a hint of Clark) as mirrored pairs, one pair in red tops and black tights, the other in black tops and red tights. At the beginning the lights stay up in the auditorium as Cunningham arrives on stage with her cast to exchange knowing glances with every one of us as we listen to Antony and the Johnsons song, For Today I am a Boy; she lets the song and its message play over us on its own terms. The inspiration of To Be Me is the ancient myth of Tiresias, the blind clairvoyant who was turned from male into female and back into male, in which Cunningham continues from m/e to further recite the fluid embodiment of both male and female narratives in a choreographic pairing, mirroring, crossing and rupturing between the four performers. She doesn’t have quite the same freedom of self-expression as in her solo, but her musicality enables her to harvest the images, narrative threads and the rhythms of Tempest’s language and to translate them for the quartet into a counterpoint of movements whose precision and abstraction embody the sheer potential of gender performativity. And she does so with wit and joy, the occasional half smile testifying to the pleasure and confidence of self-discovery.